If Something Happens to You, What Happens to Your Google Account? Although we don’t like to think about the inevitable, we will all eventually escape the charades of Microsoft and go to that big, happy computer in the sky. And if that should happen unexpectedly, what happens to all the stuff you left behind on Gmail, Google Docs, Google Photos, YouTube and other Google services? And even if it happens expectedly — what if you’re not able to make such trenchant decisions? Eh? And what if you just get tired of computers, smartphones, tablets, the Internet, Microsoft, and all things electronic and technical and decide to hermitize in SW Arizona and spend your days watching the sunrise and the scorpions crawling up your leg and swimming in your cereal bowl? What happens to all the information you left behind on your Google account(s)? 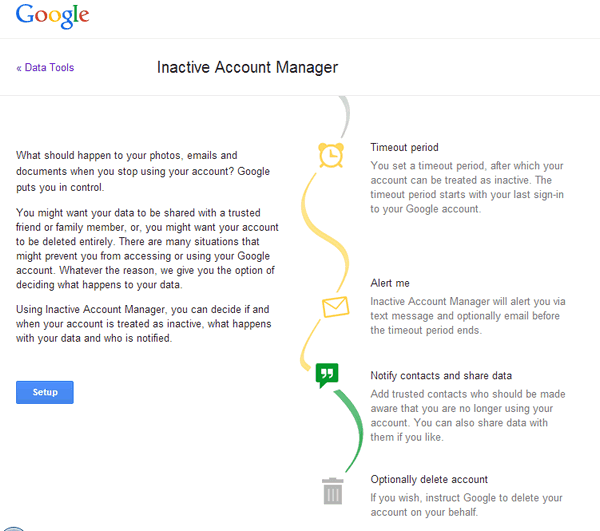 Google has an interesting feature called Inactive Account Manager. It lets you decide what to do with all the data in your Google Account(s) should something happen to you. You can give a friend or spouse or lover or whomever access to your account(s) should you no longer be around or capable or available to access them. Or, if your smart, like TC, you’ll just have Google delete your account upon your demise. Heaven knows I don’t want any of my friends or partners looking at my accounts and discovering the foibles of my worldly existence in the flesh! But what happens to your data is your choice. Setting up Inactive Account Manager for each Google Account you own is a wise idea. You can keep control of your data even while you’re floating around the pearly gates — or if you’re like EB, crossing The River Styx. What should happen to your photos, emails and documents when you stop using your account? Google puts you in control. You might want your data to be shared with a trusted friend or family member, or, you might want your account to be deleted entirely. There are many situations that might prevent you from accessing or using your Google account. Whatever the reason, we give you the option of deciding what happens to your data. Using Inactive Account Manager, you can decide if and when your account is treated as inactive, what happens with your data and who is notified. You set a timeout period, after which your account can be treated as inactive. The timeout period starts with your last sign-in to your Google account. Inactive Account Manager will alert you via text message and optionally email before the timeout period ends. Add trusted contacts who should be made aware that you are no longer using your account. You can also share data with them if you like. If you wish, instruct Google to delete your account on your behalf. There you have it. It’s a really good idea to decide what happens to your Google Account data if something happens to you. Visit https://www.google.com/settings/account/inactive and take care of business while you are still alive; there may not be any internet where you’re going. Life is short, but computer data is forever. Yes it’s exactly the same as signing in as far as Google is concerned.